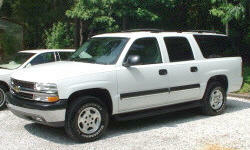 Why the 2005 Chevrolet Tahoe? This is a sharp looking truck. Mine is black with a leather interior. Amazingly smooth engine and transmission. Engine runs effortlessly. Lots of room for the kids and and luggage, when traveling. Very nice stereo system. Did not get the navigation but wish I had. I had to purchase a Magellan GPS unit, which works fine. So far... no problems at all. I hope it stays this way for more years to come. Why Not the 2005 Chevrolet Tahoe? Poor gas mileage... but I knew this before purchasing it so this is not a problem for me. If gas prices scare you... then this is not the vehicle for you.